The perfect companion and paper replacement for Planning Center Services. Find below some useful tips for getting the most out of ScriptViewer.io! After you give us a few bits of info, we will create a few options for you and get you up and going! 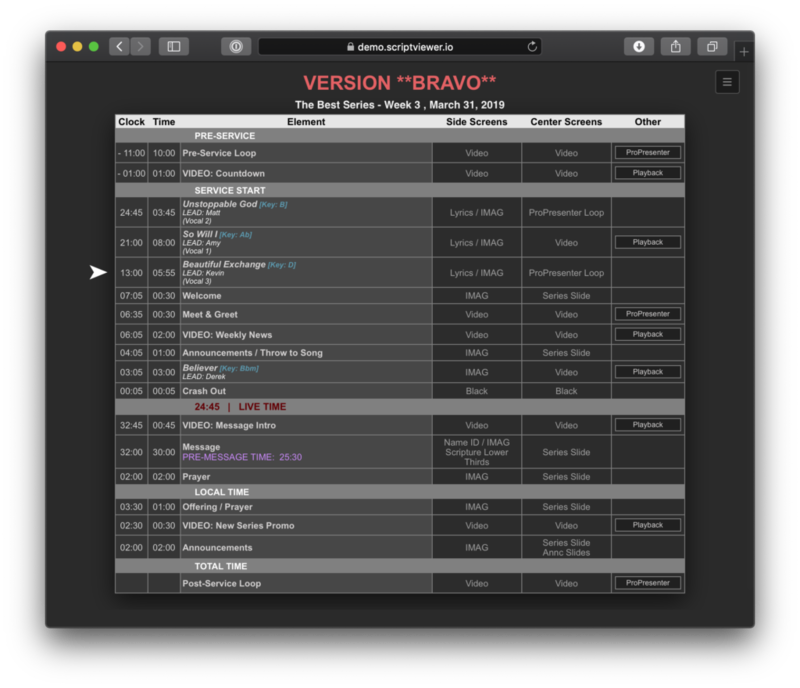 ScriptViewer is made up of Views and Layouts. The startup main page for demo.scriptviewer.io. 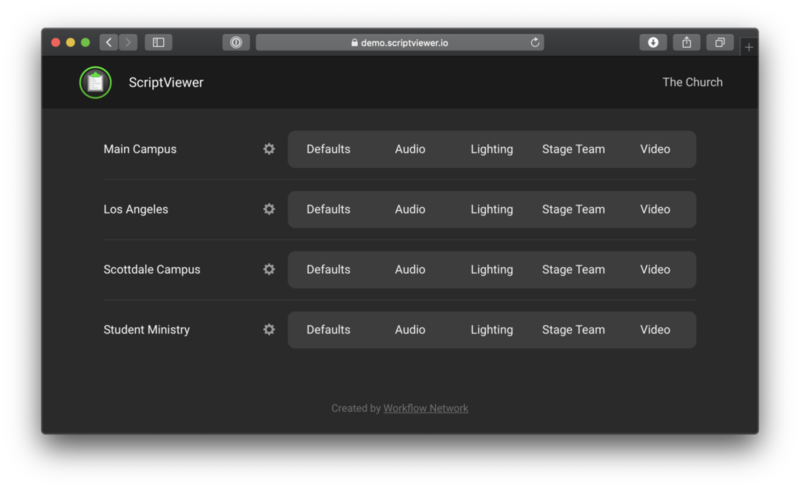 Views are assigned to a service type in your Planning Center Services. 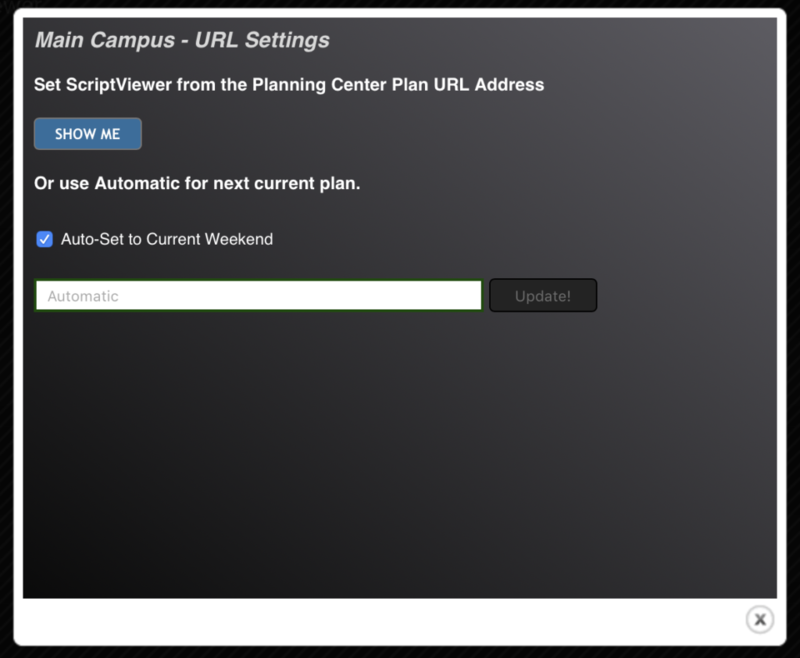 By default, ScriptViewer will show the most recent or upcoming plan like what you see in Planning Center. You can have up to five different Views on our base pricing plan. 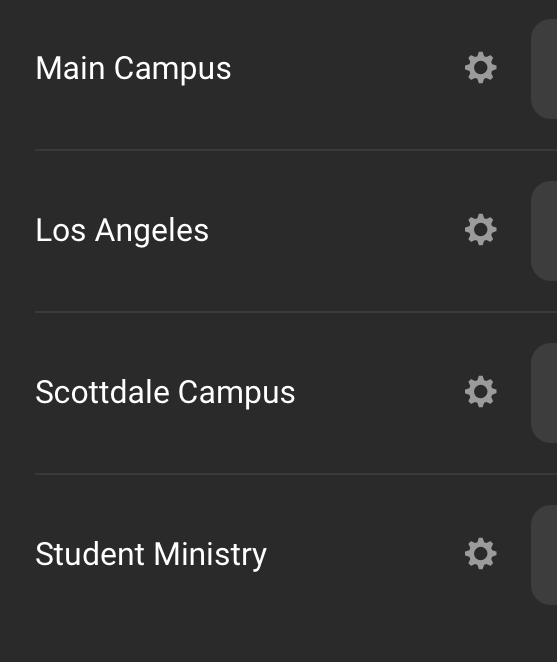 This is great for different campuses and service types. 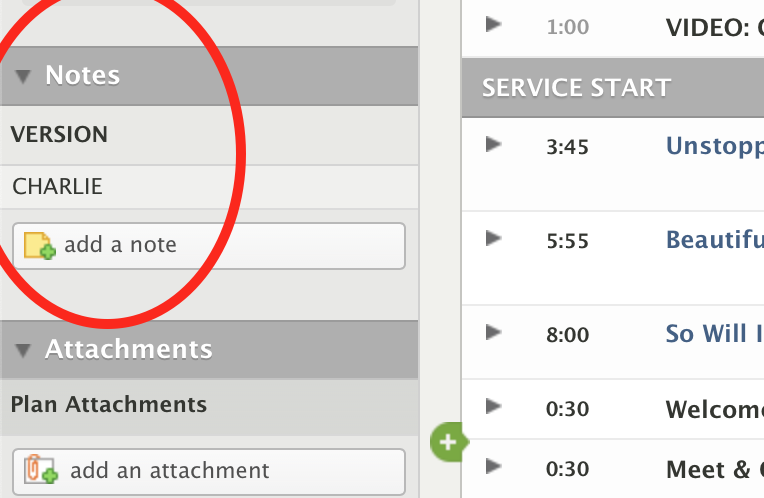 For now, simply contact us if you would like to change your default service types. See below on how to manually set what plan your view shows. Layouts are the different ways your can view your services plan. Initially, we provide a two different layout and we can optionally add up to four. Layouts are perfect for when you want to display different information to different teams. For example, here is the “Video” layout for our demo account. And then our “Stage” layout. 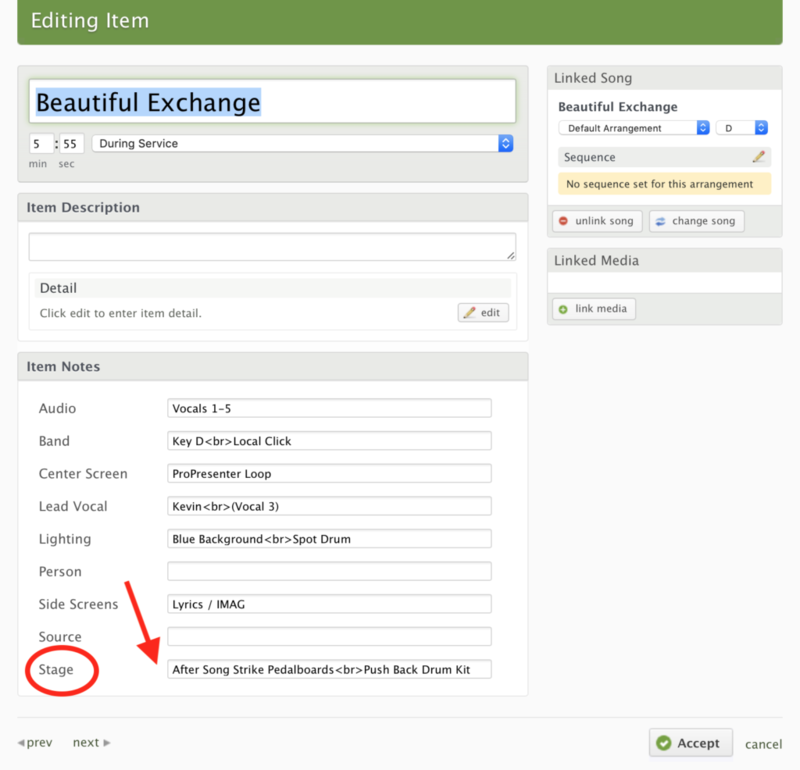 Each layout will automatically highlight a row (plan item) when you have a note in your layout category. So for the video layout, any notes in the “video” plan item note will have a nice green highlight. So, to get going, on your main site page choose the layout you want to see for the service. Then every 10 seconds or so, the page automatically refreshes with Planning Center to always stay up to date. Use the hamburger button in the top right, then simply click on your view or layout title to navigate around. What if I want a view to show a different plan? Well, we have you covered. Automatically, a view is set to a specific service type but there may come a time where you want it to look at a different plan. 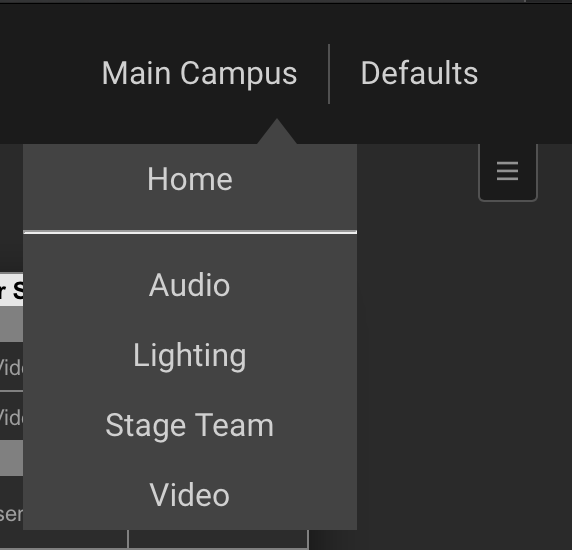 On your home page, click the settings icon next to the view where you want to make the change. 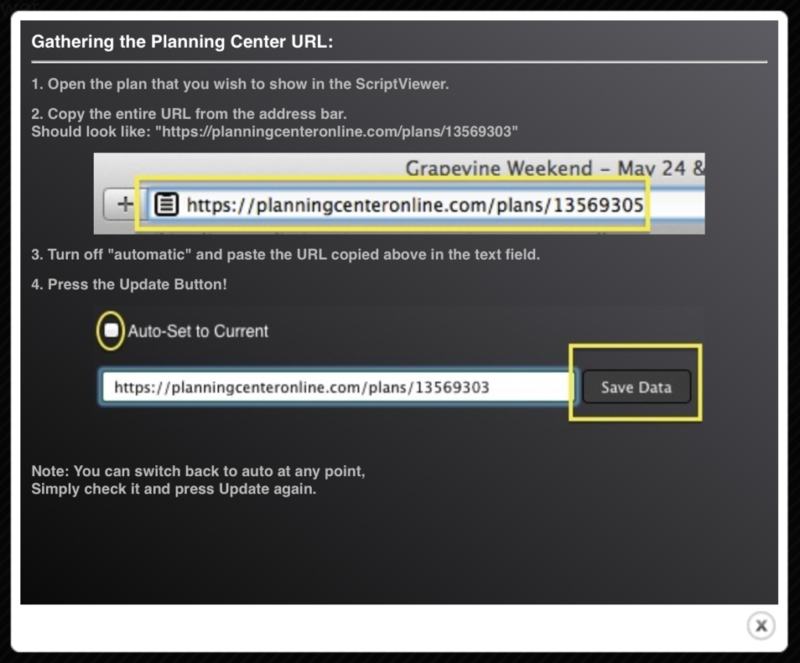 Then you can uncheck “Automatic” and simply paste in the url of your plan from Planning Center Services. Click update and then a few seconds later, anyone looking at that view will see the change. So handy! Time for the fun part. Here is the “Stage Team” layout for our demo account. 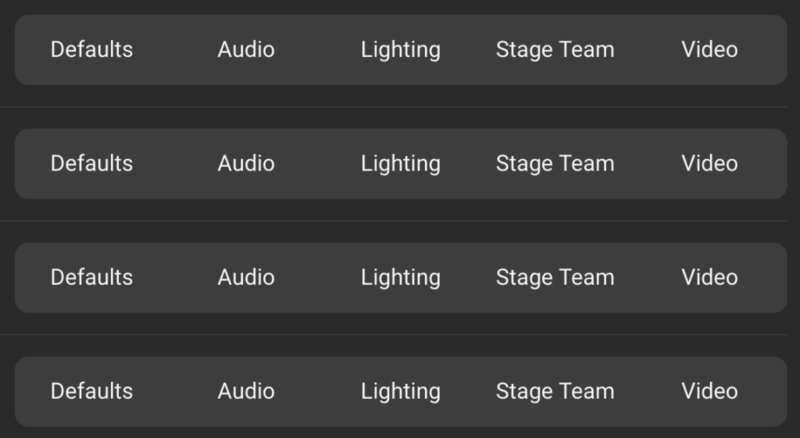 We have a plan item note category Called “Stage”. 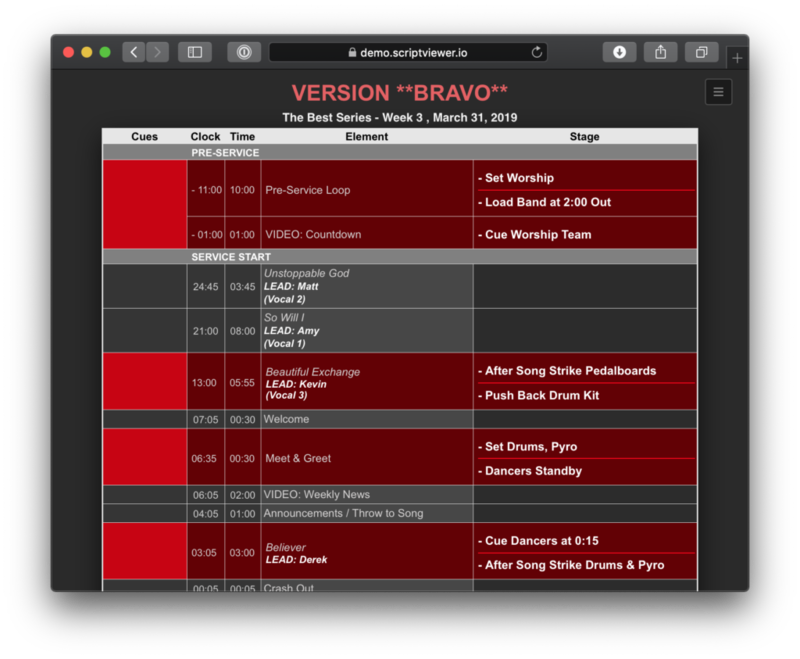 For this layout, we have coded it so that if we put anything in that note, it will be highlighted red. Now, here is the next fun part. ScriptViewer layouts support some basic html style formatting. So by adding a <br> code tag, we get a line break. Then ScriptViewer automatically adds a little separation line. To omit the line just add a capital ‘B’, so <Br> . Kinda hacky, but hey! Also pretty easy! What about Planning Center Live? Glad you asked! A little arrow will show to the left of where you are. 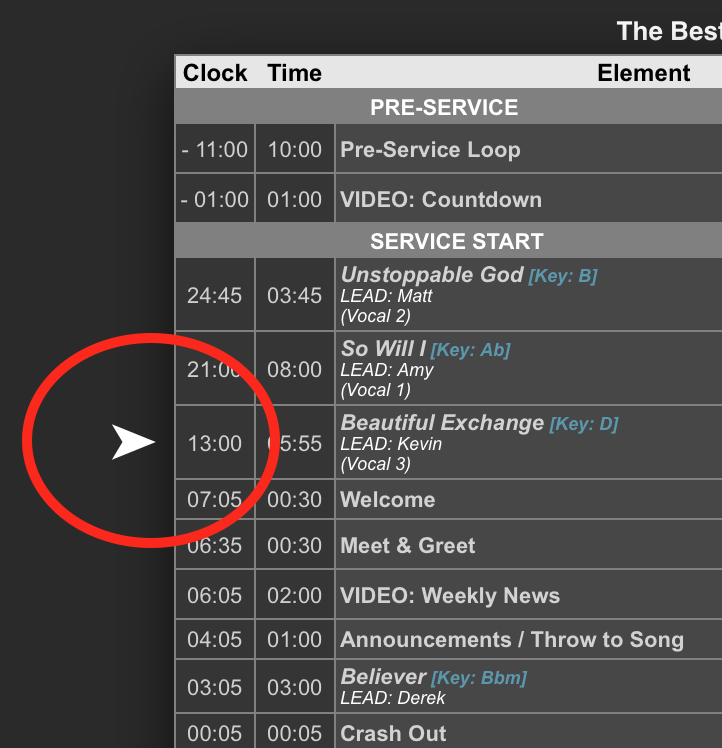 This is all controlled by Planning Center Live, so you get it automatically if this is already in your flow. Remember speedy, updates are refreshed about every 10 seconds. What about this “Version” thing? To use the “Version” (big red text on the top of your ScriptViewer), add a global Plan note called “Version. And Boom. It will appear in ScriptViewer. Overtime, we will continue to add little improvements to help make ScriptViewer be more and more incredible! As always, feel free to reach out to us any time!